A New Targeted Inch Loss & Skin Tightening Procedure That Is Painless, Immediate, and Effective! Now You Can Shrink Those Stubborn Areas That Resist Diet and Exercise! Our revolutionary machine combines three amazing technologies to achieve inch loss, skin tightening, and skin smoothing. UltraSonics: This technology removes fat cells deposits through a painless Ultrasound Cavitation procedure using a proven sound wave system. The Ultrasound waves cause a disruption of the membrane of the fat cell. Therma-Lift: Also known as the, "Non-Surgical Face Lift," this procedure offers a natural looking skin tightening and collagen building solution for face and body through the power of Radio Frequency. During treatment, the RF waves penetrate the skin to tighten it from the inside out as they stimulate collagen production which will result in tighter, more supple skin. It can be used on the entire body. 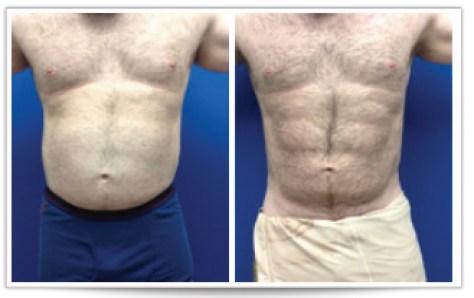 Lipo Sculpt Lite: Our machine harnesses the energy of Laser Technology to shrink targeted fat cell deposits in all areas of the body, including areas too sensitive for ultrasound. The Lipo Lite emits low levels of laser energy, which triggers a chemical signal in the fat cells to release fatty acids and glycerol. Exercise after the procedure is required to metabolize the free fatty acids for better results. Our Clients Are Raving About Their Results! Patients See Results After Their Very First Session! ✓ Lose up to 2-3 Inches Anywhere on Your Body! Results are permanent as long as you continue to eat a healthy diet. Our procedures are painless and non-invasive. You can resume normal activity as soon as the session is over! Clients report losing up to 1 inch in their very first session. Patients may have 1 session every 3-4 days. Our New Patient Special includes an initial consultation plus all three treatments! Just Imagine Achieving The Same Results as Going Through a Grueling 90 Day Diet & Exercise Boot Camp In a Relaxing Session At Your Convenience!